Dinner train rides are a relatively new type of excursion, hearkening back to the days of yore when one could enjoy first class cuisine while traveling by train. Today's experiences lack an extended, multi-day journey and typically last just a few hours. Along with providing passengers with an excellent meal these trips usually include some type of entertainment, such as a play, murder mystery, or train "robbery." In addition, there has been a growing and increasingly popular trend of providing alcohol on-board which is either included with the dinner or presented as a wine/beer tasting event. You will typically find such offerings at finer organizations such as the Strasburg Railroad, Verde Canyon Railroad, and Grand Canyon Railway. This section covers either exclusive dinner trains or regular excursions in 2019 featuring a dinner/meal, all of which are broken down by state. Please note! The information included here highlights only tourist railroads (and only those including a dinner/meal setting), most of which host day-trips to the general public lasting just a few hours. If you are interested in long-distance, intercity passenger service please visit Amtrak's website, the national rail provider. The dinner train concept has caught on in recent years as an added, upscale experience to excursion trains. 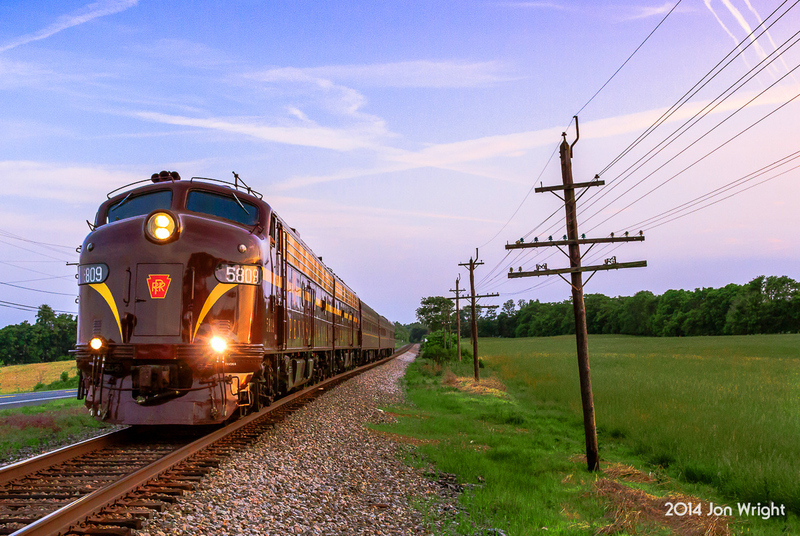 It has certainly witnessed an increase in ridership as the Strasburg Railroad, the nation's second largest tourist railroad has found out, hosting trips for more than 400,000 passengers annually! Only the White Pass & Yukon Route in Alaska is larger. In the May, 2008 issue of Trains Magazine author Erik Ledbetter highlighted Strasburg's premium services within a piece entitled, "Lessons From The Strasburg At 50." As the railroad has learned, patrons want to be pampered and are willing to pay for it. The company first provided snack/beverage service in 1988 by introducing the restored parlor car Marian that year which offered snacks and soft drinks. They were surprised to learn it sold out faster than standard coach accommodations and from that forward an increasing level of first-class services were offered. In 2006 the Strasburg received its liquor license and in 2007 hosted its first wine tasting event, which has huge it. As the railroad put it, "that has made a huge difference in our business." Such fine services are virtually non-existent via intercity rail travel today unless one can afford a pricey charter trip or owns a private railcar (a very real, but expensive, possibility!). Heart of Dixie Railroad Museum: The Heart of Dixie Railroad Museum has been telling the Alabama's railroad history since 1963 and today offers a wide range of exhibits to see. The museum also offers excursion train rides including their Ozan Vineyard Train for adults, which includes a gourmet picnic lunch after tasting at the museum's vineyard. Alaska Railroad: Alaska does not feature any true dinner trains. However, the Alaska Railroad, which hosts regularly scheduled passenger service does offer dining services aboard their trains. The ARR provides some of the most spectacular scenery by rail that can be found anywhere in the United States. A trip aboard the railroad, in general, is well worth it if you have the opportunity to do so. Grand Canyon Railway: Does not offer dining service but does feature snacks and appetizers; there are six classes to choose from during your trip and five provide some type of food and drink. This very upscale train offers one the best rail experiences found anywhere in the country. You will disembark at the historic El Tovar Hotel (built by the Atchison, Topeka & Santa Fe Railway) along the Canyon's South Rim where dining services and complete accommodations are available. Sierra Madre Express: The Sierra Madre Express is a unique, private rail tour that operates between Tuscon, crosses the Mexican border, passes through the country's breathtaking Copper Canyon, and operates as far as Creel/Divisadero. This is a fully staffed train with complete on-board services similar to those found during the "Golden Age" of rail travel, which includes complete dining amenities. Verde Canyon Railroad: The Verde Canyon offers appetizers and alcoholic drinks in their first-class accommodations and snacks within coach class. They also provide several vacation packages for the surrounding Sedona area. Eureka Springs & North Arkansas Railway: Offers dinner service aboard their dining car known as the Eurekan, with wine and champagne available. They provide dinner and lunch services in the car, which is offered from May through October. For complete information and menus please visit the railroad's website. California Western Railroad: Typically the famous steam-powered "Skunk Train" does not feature dining services. However, during the summer months they offer riders a barbecue along the way at Northspur known as the "Sunset BBQ Excursion" which is powered by their restored motor car and hosted from Memorial Day to Labor Day. In addition, the railroad hosts two trains which do provide on-board dining; the Sacramento RiverTrain and Sierra DinnerTrain. Fillmore & Western Railway: The Fillmore & Western features dinner and live entertainment in the way of a murder mystery train with lunch and dinner schedules available. They also offer special events tailored around dining such as Dinner With Santa and a New Year's Eve party. Napa Valley Wine Train: Perhaps the best dinner train experience you can enjoy throughout the country-wide is the Napa Valley Wine Train. They host a wide range of dinner options (including wine) aboard their train which operates through the beautiful Napa Valley region. Niles Canyon Railway: The Niles Canyon Railway features a number of different trips throughout the year, including a wine tasting special and "Romance On The Rails" for Valentine's Day. Rail Journeys West: Less of a true dinner train, Rail Journeys West offers private rail car services if you plan to travel by train (i.e., such as via Amtrak). This service truly hearkens back to the "Golden Age" of rail travel with full meals provided as well as entertainment. Roaring Camp Railroad: The Roaring Camp & Big Trees Narrow Gauge Railroad operates the "Moonlight Dinner Train Party" during select dates that features food, a train ride, and live entertainment. Santa Cruz & Monterey Bay Railway: The Santa Cruz & Monterey Bay is a newer excursion offering incredible scenery along California's beautiful Monterey Bay running over former Southern Pacific trackage. Their upscale accommodations also include full-course meals and luxurious interior settings. Yosemite Mountain Sugar Pine Railroad: During select times throughout the operating season the railroad operates specials known as the Moonlight Train Ride & BBQ, which feature dinner at the station, a train ride, and live entertainment. Cumbres & Toltec Scenic Railroad: The Cumbres & Toltec Scenic is another famous narrow-gauge tourist railroad located in southwestern Colorado and northwest New Mexico. It operates over the former Rio Grande, complete with original steam locomotives from that railroad (the nearly identical Durango & Silverton operates former D&RGW trackage nearby). Two of the popular C&TS specials is the Sunset Dinner Train and Osier Dinner Train. Durango & Silverton Narrow Gauge Railroad: One of the most famous excursion nationwdie, the D&SNG offers spectacular views of southern Colorado with several special events throughout the operating season. The railroad provides a range of on-board classes from Presidential to Standard. The upscale classes include beverages and/or snacks while they also host wine tasting events. Georgetown Loop Railroad: The narrow-gauge Georgetown Loop Railroad is a short, but very popular scenic railroad located in Georgetown, Colorado. It is operated by the Colorado Historical Society as part of the larger Georgetown Loop Historic Mining & Railroad Park. Trips are available in three different classes with parlor and presidential providing snacks and refreshments. Leadville, Colorado & Southern Railroad: Offers special train rides throughout the season that include both barbecues (the Devils Tail BBQ Special) and served boxed lunches (the Wild Flower Special). Rio Grande Scenic Railroad: The Rio Grande Scenic Railroad is a new tourist railroad based in Alamosa, Colorado that has been operating only since 2006. The railroad operates exclusively over ex-Rio Grande trackage and features food/beverages in their dome car. Also be sure and ask about their classes of service and Oktoberfest event. Royal Gorge Route Railroad: Another of Colorado's fine tourist trains, the Royal Gorge Route Railroad offers several different meal services from lunch to dinner and murder mystery specials. There are also a number of other events hosted throughout the year. To learn more about planning a trip through Colorado's stunning Royal Gorge please visit their website. Essex Steam Train: This popular excursion train offers a full service dinner train throughout the operating season in addition to several specials involving some type of dining available. Their menu can be viewed online. Please visit their website for much more about scheduling, times, and dates. Wilmington & Western Railroad: The Wilmington & Western offers several different types of train trips, including a number of dinner trains such as the Mother's Day Buffet Dinner Train, Ride-To-Dine Dinner Train, and murder mystery specials that provide desserts and beverages. Also, for the railroad hosts "Brews On Board" where adults over 21 can sample local brewery craft beers. Orlando & North Western Railway: Also known as the "The Royal Palm Railway Experience," the Orlando & North Western operates track owned by the Florida Central Railroad. It hosts a number of upscale trips with food or beverages provided such as the Royal Pizza Express, BBQ Limited, and even a wine train. Seminole Gulf Railway: The Seminole Gulf Railway is actually a freight railroad which hosts a very popular Murder Mystery Dinner Train that is well known for the on board meals they serve. Throughout the year the railroad hosts a number of different "mysteries" as well as special events for the holidays. To learn more about this popular attraction please visit their website. Blue Ridge Scenic Railway: The most popular tourist railroad in Georgia is the Blue Ridge Scenic Railway. It is located in the northern mountainous regions and operates over 13 miles. The company does not offer full dining services on-board but its "Premier Class" accommodations (18 years or older) provide an enjoyable trip. According to the railroad; "you will experience individualized service in a coach featuring comfortable, reclining seats. Non-alcoholic beverages and snacks are served during the trip and passengers will receive a special gift." SAM Shortline Excursion Train: The SAM Shortline, located in Cordele, Georgia is a beautiful operation that features nearly a 70-mile round trip. There are no dinner trains provided by the railroad but they do offer Premier and VIP Seating classes which provide for snacks and beverages during your trip. New Heights Rail and Rail Center, LLC: Affordable Excursions on Beautiful Private Railcars offered from Chicago Union Station during November 3rd and 4th. Special trips are in conjunction with ‘RailNation Chicago,’ the 50th anniversary celebration of the Rail Passengers Association. 2017 marked the 50th anniversary of the founding, in Chicago, of the National Association of Railroad Passengers, the nation’s foremost grassroots organization representing the users of passenger trains and rail transit and advocating the expansion and improvement of the United States’ national network of passenger trains. To commemorate a half century of progress for rail users, the Association is hosting ‘RailNation Chicago,’ a four-day celebration of all things rail in the nation’s railroad hub that will bring notable speakers, historic railroad equipment and displays, and more to the Windy City from November 2 through 5. To help NARP Celebrate their anniversary New Heights Rail and the RailCenter LLC are offering two private passenger trains to commemorate the occasion. On Saturday, Nov. 4, a special train will depart Union Station at 11:00 AM for a special 3-hour trip covering the Southwest Service with lunch served on board, returning to Union Station at 1:45 PM. A three course lunch will be provided, consisting of lemon chicken, garlic potatoes wedges, green beans, a fresh salad, and a decadent dessert. Tickets for this excursion will be $100 per person for First Class, and 150 for Dome Class. On Saturday, Nov. 4, a dinner train will depart Union Station at 7:00 PM. Every passenger will be served a sumptuous three-course meal over the course of a two and a half-hour round-trip to Manhattan, Ill. and back on Metra’s SouthWest Service route, traveling via Oak Lawn, Chicago Ridge, Palos Park, Orland Park and New Lenox. The train returns to Union Station at 9:30 PM. A ticket on this trip, which includes dinner, will cost $110 for First Class, and 160 for Dome Class. This is a rare opportunity to join fellow rail travelers to celebrate the past, present and future of passenger trains on board unique railcars in a city built by railroads. We look forward to having you on board. To purchase tickets please click here. Indiana Railway Museum/French Lick Scenic Railway: The Indiana Railway Museum operates the French Lick Scenic Railway, featuring a 20-mile round trip through the Hoosier National Forest. The organization does not offer dedicated dinner trains but does host the "Train To Strassenfest." It is an old-world German event where passengers can enjoy a 4 1/2-hour layover in Jasper to enjoy food and festivities. Whitewater Valley Railroad: What would certainly be considered arguably Indiana's most popular excursion trains the Whitewater Valley Railroad is based Connersville. The tourist railroad does not feature on-board dinners but does offer the Twilight Limited Train to Dinner where passengers are taken to the nearby Laurel Hotel for dinner. They also host their "Wild West Train To Dinner" during the summer and early fall. To learn more please visit their website. Boone & Scenic Valley Railroad: The Boone & Scenic Valley offers three different dinner-style trips including a standard dinner train, dessert train, and picnic train provided within their restored dining car. To learn more about their menu and pricing with these special trips please visit the railroad's website for complete information. Abilene & Smoky Valley Railroad: This 13-mile excursion train features a dinner train during select times of the year operating over former Rock Island trackage. The railroad states advance purchase is necessary to book this particular trip, offered on select dates from May through October (on rare occasion, a steam locomotive will pull this train). To learn more please visit their website. Midland Railway: The all-volunteer Midland Railway, based in the eastern Kansas town of Baldwin City, is a fairly popular excursions operating regular excursions from April through October (special holiday events are hosted outside these months). They have an impressive collection of equipment and operate a railroad that stretches about 20-miles. One of their popular trips is the Kansas Belle Dinner Train which utilizes four restored dining cars. The railroad's website notes: "Our three-hour Saturday night evening runs are more formal and romantic, while the Sunday afternoon dinner run is a more casual outing best suited for families with a slightly shorter run time. You may want to enhance your dinner train experience with an optional murder mystery, WWII USO show, or a melodrama." Big South Fork Scenic Railway: This railroad does not feature first-class dining although it does offer a "Coal Miner's Lunch," "Hobo Lunch," and "Coal Bucket Concession" for an additional ticket fee along their 16-mile round trip through the Daniel Boone National Forest and Big South Fork National River & Recreation Area. In addition, the Whistle Stop Restaurant & Steakhouse in Stearns offers lunch and dinner at select times throughout the week. My Old Kentucky Dinner Train: Operated by the RJ Corman Railroad Group, a corporation which owns a number of short lines freight systems, this train is based in Bardstown and operates two to three days a week from during the summer season and at least once a week year-round. The train has become well-known for its fine dining. Kentucky Railway Museum: The Kentucky Railway Museum operates excursion trains on its property including a dinner train once a month during the operating season. The museum notes that casual dress is preferred while reservations are required. They also host a mystery theatre during select dates which includes a meal with the show. Maine Narrow-Gauge Railroad & Museum: The Maine Narrow-Gauge Railroad & Museum operates a two-foot narrow-gauge railroad using restored steam locomotives. The railroad hosts a number of special events such as the Wine Wise – Cork & Rail Limited. While not a true dinner train experience, this wine tasting event also includes food pairings. Walkersville Southern Railroad: The Walkersville Southern offers several special trains throughout the year serving either refreshments or full-service meals aboard their available dining car (they also offer standard dinner trains and murder mystery specials). These trips usually sell out in advance so please book your trip early if interested! 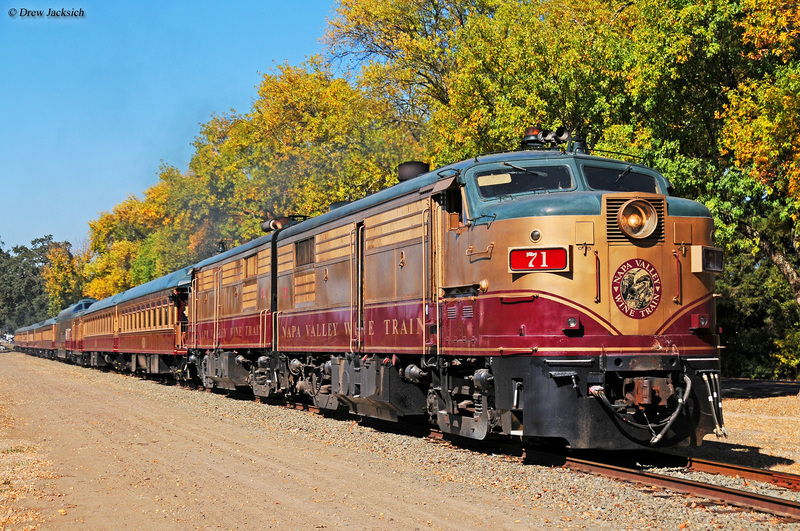 Western Maryland Scenic Railroad: The WMSR has blossomed into one of the most popular excursion experiences in the country operating between Cumberland and Frostburg. They feature many different trains throughout the season including murder mystery specials (that include full-service meals) provided in either a first class or lounge setting. To learn more please visit the railroad's website. Cape Cod Central Railroad: The deluxe Cape Cod Central Railroad offers a handful of different trains which include some type of dining. For information regarding scheduling and pricing please visit their website. Adrian & Blissfield Railroad: The Adrian & Blissfield Railroad, which is first a freight-carrying short line, also hosts the Old Road Dinner Train which features both a standard dinner as well as a murder mystery special. To learn more about riding their trains please visit the railroad's website. Coopersville & Marne Railway: The Coopersville & Marne Railway, based in Coopersville, Michigan offers a wide variety of train rides to choose from. They do not offer dinner trains or food service but do provide pizza train charters (30 or more individuals) for those interested. To learn more please visit their website. North Shore Scenic Railroad: Operated by the Lake Superior Railroad Museum this excursion offers numerous events that include on-board food service such as the Elegant Dinner Train to murder mystery specials. In addition they host the Wine Tasting Dinner, BBQ Train, Father's Day BBQ Lunch, and the Mother's Day Luncheon Limited. To learn more please visit their website! Osceola & St. Croix Valley Railway: Operated by the Minnesota Transportation Museum this tourist train features available Brunch Trains, Pizza Trains, and Dinner Trains during their operating season. To learn more about these trips, and others, please visit the museum's website. Belton, Grandview & Kansas City Railroad: The Belton, Grandview and Kansas City Railroad does not feature full service meals aboard their trains. However, they do offer "Ice Cream Specials" a few times during the summer season where visitors can enjoy a bowl of ice cream during their trip. Branson Scenic Railway: The popular Branson Scenic Railway features a 40-mile round trip on their excursion, which includes a dinner train option during the operating season. To learn more about these trips please visit the railroad's website. St. Louis, Iron Mountain & Southern Railway: The St. Louis, Iron Mountain & Southern offers a ten-mile excursion through the rolling, open countryside of southeastern Missouri. They offer several specials throughout the year, some of which include dining and/or food such as the Chocolate Express, Murder Mystery Dinner Train, and the "Chuck Wagon Dinner at Iron Mountain Junction." Charlie Russell Chew Choo: A sometimes forgotten dinner train operation is the Charlie Russell Chew Choo is based in Lewistown along the only former Milwaukee Road still intact in the west-central region of the state. The train covers 28 miles (56-mile round trip) and operates nearly every weekend during the summer season. To learn more please visit their website. Nevada Northern Railway: Operated by the Nevada State Railroad Museum at Carson City this tourist train offers the "Taste of Italy" dinner train. According to the railroad this event offers the following: "Your coaches will be pulled by one of our century-old steam locomotives for a trip on the Nevada Northern Railway mainline. It will be our pleasure to serve you a classic, multi-course Italian meal, complete with flowing wine, and dessert." To learn more please visit their website. Virginia & Truckee Railway: The historic Virginia & Truckee Railway began with its 1869 chartering in 1869 to serve Reno and Carson City. . Today, about fifteen miles are operable. They have slowly added an increasing number of excursion options including "Toast of the Canyon Wine Tasting Train" and the "Dinner & Melodrama Train." Cafe Lafayette Dinner Train: The Cafe Lafayette Dinner Train based in Woodstock features only dinner trains, which operates only on select dates. For information regarding reservations, pricing, and menus please visit their website. 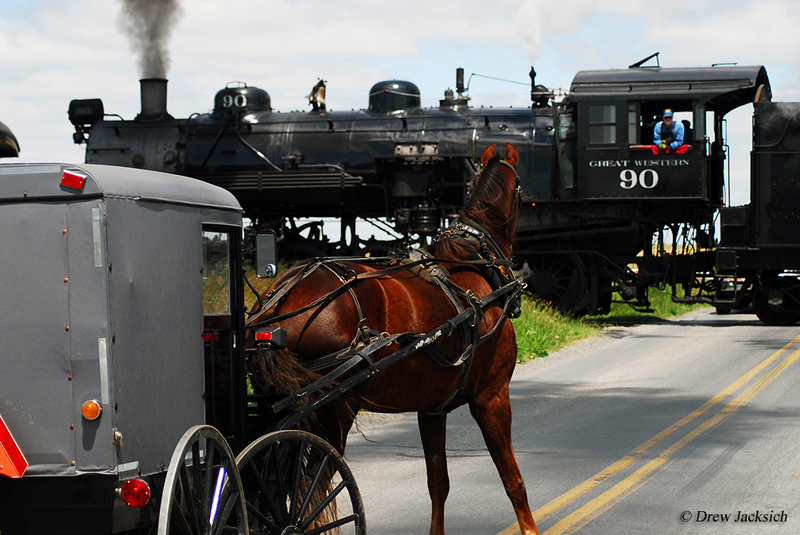 Conway Scenic Railroad: The Conway Scenic Railroad is one of the more popular tourist trains. As part of their service first-class dining is an option during your trip through beautiful New England in the Mt. Washington Valley. They have two restored dining cars available; the Chocorua on the Valley Trains and the Hattie Evans as part of the Notch Train’s First Class Package. To learn more please visit the railroad's website. Hobo Railroad: Despite its name the Hobo Railroad offers first-class accommodations aboard their trains, which include specials and Fall Foliage Dinner Trains, hosted to coincide with the spectacular colors of autumn in New England. To learn more about the Hobo's trips and events please visit their website. Black River & Western Railroad: The Black River & Western, based in Ringoes, New Jersey operates from the town's restored depot. They do not offer a dedicated dinner train or any type of food service aboard their trips. However, there is a Winery Train hosted where patrons are taken to a vineyard located in nearby Finesville, New Jersey to sample their wines. Cumbres & Toltec Scenic Railroad: Please visit the Colorado section above to learn more about the Cumbres & Toltec Scenic's available dinner trains. Adirondack Scenic Railroad: While the Adirondack Scenic does not offer on board meals a number of their special trains operated throughout the year does include the addition of their cafe car. In addition, two noteworthy specials of interest is the Soda Fountain Lunch Train and Beer & Wine Train. To learn more about all of their trips, which depart from various locations, please visit the railroad's website. Arcade & Attica Railroad: The A&A is based in Arcade, New York and utilizes trackage originally built and owned by the Buffalo, Attica & Arcade Railroad. They do not host a dedicated dinner service but do host a "Wine Tasters Special." Cooperstown & Charlotte Valley Railroad: The Cooperstown & Charlotte Valley Railroad, operated by the Leatherstocking Railway Historical Society, uses tracks originally built by a company of the same name, the Cooperstown & Charlotte Valley. They operate two specials which include food and/or beverages; the Brooks BBQ Dinner Trains and Ice Cream Social Train. Delaware & Ulster Railroad: The Delaware & Ulster Rail is based in Stamford, using trackage originally owned by the Ulster & Delaware Railroad. Their Rip Van Winkle Flyer whisks passenger back in time aboard dome, tavern, and observation cars to experience rail travel as it was in the mid-20th century, which includes a full-course meal. To learn more please visit their website. Great Smoky Mountains Railroad: The Great Smoky Mountains Railroad offers several trains which include full course meals within a variety of classes along its route following the beautiful Smoky Mountains in western North Carolina. To learn more about their menu, pricing, and scheduling, please visit the railroad's website. New Hope Valley Railway: The New Hope Valley Railway is based in New Hill, North Carolina. The organization does not host a dedicated dinner train but they do run specials involving food and/or beverages under the heading of Brew ‘n’ Choo (this event has its own specials during the year). Cuyahoga Valley Scenic Railroad: The popular Cuyahoga Valley Scenic Railroad now hosts a dedicated dinner train known as "Evening Dining on the Rails." They also operate a number of other events which either include food or wine tasting. Please visit their website to learn more about special events and trips. Lebanon Mason Monroe Railroad: The Lebanon Mason Monroe Railroad is based in Lebanon, Ohio and uses trackage once owned by the Pennsylvania Railroad. Throughout the operating season they host murder mystery specials, which includes a buffet at the historic Golden Lamb in Lebanon. In addition, the organization offers pizza trains and wine/beer tasting events. To learn more please visit their website. Mount Hood Railroad: The Mount Hood Railroad offers full course meals on many of its trains throughout the operating season. They provide different classes of service (Standard, First, and Diamond) in addition to many special events throughout the year. To learn more about their trips please visit the railroad's website. Oregon Coast Scenic Railroad: The Oregon Coast Scenic Railroad is based in Tillamook and has operated on the Port of Tillamook Bay Railroad since 2003 using a historic Climax geared steam locomotive and standard 2-6-2 for power (#2 and #25 respectively). They regularly offer dinner trains during the operating season, a three-hour trip. To learn more about scheduling and pricing please visit their website. Colebrookdale Railroad: A relatively new excursion, the Colebrookdale Railroad, also known as the Secret Valley Line, began service in 2014 and operates 8.6 miles between Boyertown and Pottstown. They host several specials with food and beverages involved including the Valentine's Day Train, Mother’s Day Tea Train, and Father's Day Beef & Beer. Middletown & Hummelstown Railroad: Also an operating freight railroad the M&H runs excursion trains during the warmer months of the year. It operates the Murder Mystery Dinner Train during select dates. New Hope & Ivyland Railroad: The New Hope & Ivyland Railroad, one of the more well known tourist lines in the country, offers a wide range of trips involving on-board dining and full course meals, operated as both special events and regular excursions. To learn more about the their offerings please visit their website. Oil Creek & Titusville Railroad: The Oil Creek & Titusville Railroad, based in Titusville, operates roughly 14 miles normally using a traditional diesel locomotive for power. During the latter half of their operating season they host Murder Mystery Dinners. To learn more please visit their website. Strasburg Railroad: The second-most popular tourist railroad in the country offers full course meals and other refreshments, including available wine and alcohol aboard their lavishly restored 19th century equipment. To learn more about their many services and special events please visit Strasburg's website. Tioga Central Railroad: The Tioga Central operates on trackage that once belonged to the New York Central. One of their popular specials is the Sunset Dinner Train hosted throughout the operating season. To learn more about this trip please visit the railroad's website. Wanamaker, Kempton & Southern Railroad: The WK&S, based in Kempton (eastern Pennsylvania), operates a unique blend of steam and diesel locomotives. They do not host a dedicated dinner train but do offer the Wine & Cheese special. To learn more please visit their website. West Chester Railroad: The West Chester Railroads does not offer a true dinner train. However, during most weekends throughout the summer they host a special picnic train by the same name, the Summer Picnic Special, from June through September. Newport Dinner Train: The Newport Dinner Train is one of New England's more popular such venues. As the name suggests its hosts full service meals on-board with but also offers other trains such as luncheons and murder mysteries. To learn much more about all of their trips and on-board amenities please visit their website. South Carolina Railroad Museum: The South Carolina Railroad Museum, based in Columbia, predominantly looks to preserve the state's heritage and has accrued a wide collection of equipment. They also host excursion trains between during the warmer months. Their regular trips include First Class accommodations that offer beverages and a light snack while private charters for large groups also have optional food service. Finally, one of their special events is the BBQ Dinner Trains hosted on select dates. Black Hills Central Railroad: While the upscale Black Hills Central Railroad's 1880 Train does not feature meals aboard their trips they do offer excursions tailored to alcoholic beverages, the Wine Express, Rails & Ales, and Wine On The Rails. There is also Oktoberfest hosted each September that brings a taste of Germany to the railroad. Tennessee Central Railway Museum: The Tennessee Central Railway Museum is based in Nashville and focused primarily on preserving the state's rail history. The organization hosts very long excursion that journey up to 180 miles (round-trip). They do not offer dinner trains but do host wine trains where patrons can ride out to the DelMonaco Winery while enjoying wine tasting and tours. There is also live music and lunch available. Austin Steam Train Association: The Austin Steam Train is based in Austin, Texas operating through the state's "Hill Country" using tracks once owned by the Southern Pacific. The organization maintains an impressive fleet of restored passenger equipment that includes lounge cars providing light snacks and alcoholic/non-alcoholic beverages. To learn more about their trips and excursions please visit their website. Grapevine Vintage Railroad: Operated between Grapevine and the Fort Worth Stockyards this excursion train does not feature dinner trains but does participate in the GrapeFest wine tasting event. Please visit their website for more information. Texas State Railroad: The popular Texas State Railroad, now a division of Iowa Pacific, does not provide full course meals aboard its trains but does offer upper class services which include appetizers and non-alcoholic/alcoholic beverages. You can learn more about these at their website. Heber Valley Railroad: Utah's most popular excursion is the Heber Valley, which has utilized the Rio Grande's 28-mile Provo Canyon Branch (Heber City to Provo) since the 1990s. The railroad does not host a dedicated dinner train but does have an optional boxed lunch, at an addition cost, on some trips. Green Mountain Railroad: Operating on former Rutland Railroad trackage the Green Mountain Railroad is one of the country's popular tourist railroads offering breathtaking New England scenery. During the course of the year it hosts a select number of full course dinner trains such as the Fall Foliage Dinner Train. In addition, beginning in 2018 they will begin running the all new Champlain Valley Dinner Train. Chehalis Centralia Railroad: Also a museum, this tourist railroad is based in Chehalis featuring murder mystery dinner trains during select dates throughout the year (these trips usually sell out!). They also host the Mother's Day Brunch/Dinner Trains. You can learn more about their services at their website. Chelatchie Prairie Railroad: The Chelatchie Prairie Railroad, located in Yacolt, operates on former logging trackage between Chelatchie Prairie and Lucia Falls. The railroad normally operates between May and October with specials that include dinner trains. Also be sure and check out their dinner/wine trains hosted each fall. To learn more about these events please visit their website. Mount Rainier Scenic Railroad: Based in Elbe, the Mount Rainier Scenic operates on former Milwaukee Road trackage. Among their excursions is first-class accommodations that includes light snacks and beverages.. They also host a wine train which includes wine tasting, refreshments, and live entertainment. Finally, the Oktoberfest Express offers the adults a chance to sample locally crafted beers. Cass Scenic Railroad: Operating on former logging lines in the heart of the state's Appalachian region Cass Scenic Railroad, now a division of the Durbin & Greenbrier Valley, always operates trains with a fleet of geared steam locomotives, usually Shays. Some of their excursions provide lunch service. To learn more please visit the railroad's website. Potomac Eagle Scenic Railroad: This popular excursion operates former Baltimore & Ohio trackage in the eastern region of the state. Their restored club car offers light snacks and refreshments on-board. West Virginia Central Railroad: Also an operating freight railroad the WVC, another division of the D&GV, features several different trips including its climate-controlled New Tygart Flyer, which has the option of buffet service. They also host the popular Mountain Explorer Dinner Train. Finally, be sure to learn more about their Murder Mystery Wine Train. Osceola & St. Croix Valley Railway: To learn more about the Osceola & St. Croix Valley's dinner train services please visit the Minnesota section of this page. East Troy Railroad: The East Troy Electric Railroad, based in East Troy is actually a trolley/interurban operation. However, it also operates a popular dinner train during the operating season. In addition, the organization hosts special dinner trains throughout the year and even pizza trains. Mid-Continent Railway: Also a museum, based in North Freedom, this tourist railroad features full course dinners aboard its train in February, May, and October. There are numerous specials hosted throughout the year which include on-board food service. To learn more about all of the railroad's offerings please visit their website. Wisconsin Great Northern Railroad: Based in Spooner, Wisconsin this tourist railroad offers many different meals aboard a select number of its trains from full course dinners to brunches, buffets, and BBQs. They also host a Pizza Train for the Christmas season. Finally, they provide host bed & breakfast accommodations!